So how do we treat dry mouth and prevent the uncomfortable symptoms and higher risk of decay that it can lead to? If you are taking more than 2 medications regularly this can increase your risk of dry mouth as they are common side effects of certain medications. Taking 3-4 medications increases the risk of dry mouth by up to 50% and taking 6-7 medications increases this up to 65%4, 5. You may consider having a chat to your GP to review your use of medications so that it is optimal. Dry mouth can be a sign of underlying medical conditions which need to be investigated and treated, particularly Sjogren’s syndrome6 and diabetes7. Even mouth breathing can be a sign that you have a chronically blocked nose and this can cause dry mouth. Keep hydrated by drinking lots of tap water throughout the day. Most GP’s recommend 2 litres a day as a guide. It is important this water has fluoride to give your teeth maximum protection against decay as bottled water often does not contain any fluoride. Avoid foods and drinks that tend to dehydrate your body including anything with caffeine (coffee, tea) or alcohol, as well as smoking. There are products available to artificially moisten the mouth such as mouth sprays, gels, washes and toothpastes. 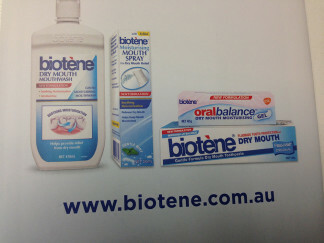 Brands sold on the Australian market include Aquae, Biotene , GC dry mouth gel &amp; others. Speak to us to find out which products might suit you! 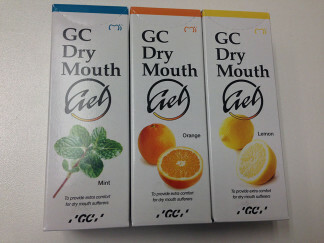 For patients who cannot avoid situations where dry mouth is an inevitable consequence, such as those who have been treated with chemotherapy/radiotherapy, your GP can even prescribe medications that stimulate the production of more saliva in the mouth3. So don’t put it off any longer and don’t be shy. Come in to Seymour Dental and we can have a chat to you about your dry mouth, and help create a treatment plan customised to suit your needs and keep your dentally fit.